Pipos recently released a new line of 1/6 vinyl dolls, and since I’ve long been a fan of their cute cats I decided to pick up a few. ‘Mariko‘ is 19cm tall and has few points of articulation compared to other vinyl dolls like Obitsu. The style and scale are more similar to vinyl fashion dolls in 1/6 scale like Barbie, Licca, etc. 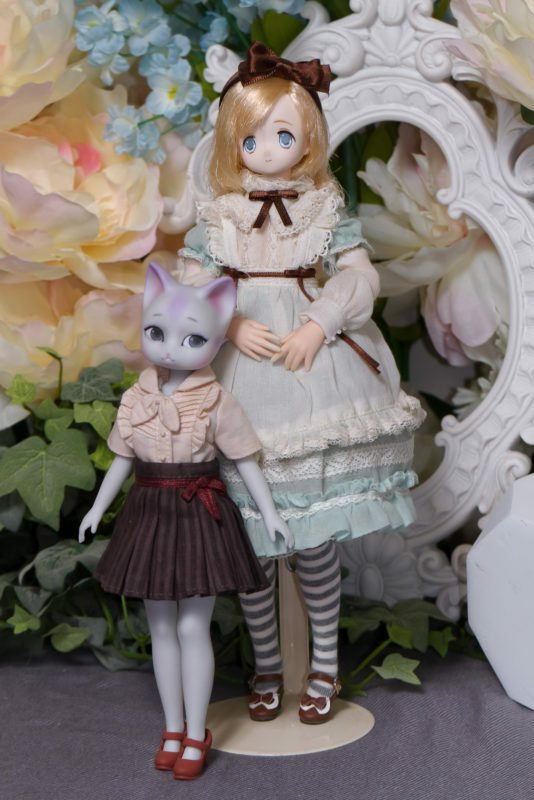 I’ve noticed an increasing number of artists in Asia making vinyl dolls like these – probably a combination of the costs of vinyl toy production are getting lower, demand for more artistic fashion dolls is increasing, and the cheap price of these dolls deters recasters/bootleggers. Mariko has been released as a cat in 3 fantasy colors, and as a human in a light skin tone. I got gray, pink and white Mariko unpainted cats and a pair of shoes to test out. Compared to PureNeemo, Mariko is much shorter. Her 2.1cm feet are also too small for the Azone size shoes- the ones she’s wearing here are also from Pipos. The Azone PureNeemo clothes I’ve got are pretty big on her- big collars, sleeves too long, though a few pieces work alright. Pink Mariko from behind shows another feature – high heel feet. 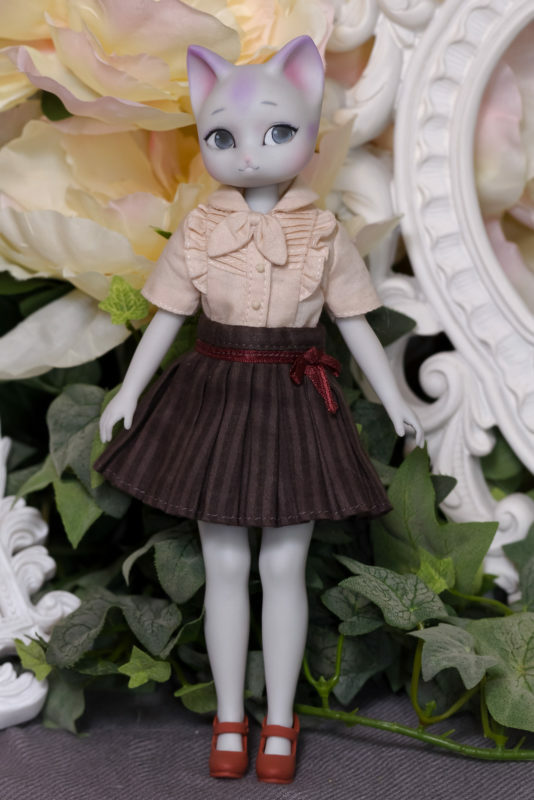 Really wish I knew more about fashion dolls since I have no idea where to get tiny heel shoes for her! Also, no tail is included, not even a magnetic one like the Pipos resin cats have got. Shoulders, hips, torso and head have a wide range of motion, but posing is still pretty limited. I unearthed some small Obitsu vinyl shoes that fit her alright, but again without heels she’s not able to stand alone. Pink Mariko’s faceup isn’t complete, but you can see that the eyes and nose are subtly sculpted. If you want significantly different eye shapes you’ll have to modify the head before painting it. At $60 a blank Mariko costs a bit more than a DD head but far less than any 1/6 resin doll. She’s fun to play with and customize, I just wish I had a doll wardrobe that was compatible with her size.